As my annual spring ritual of ski touring in the Alps rolled around, I was a bit worried for a few reasons. First, most of Europe had an extremely low snow year. Coming off a huge winter in Crested Butte, I was not really looking forward to bad snow conditions and cracked up glaciers. Secondly, coming off of a huge winter in Crested Butte, I was ready to be done skiing and wanted to start my climbing season instead. Luckily, conditions up high in the Alps remained good and a combination of good snow, perfect weather and great clients keep my skiing spirits high! 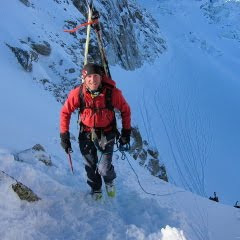 First up was a Silvretta Ski Traverse (http://www.stevebanksmountainguide.com/Site/Silvretta.html). This region of the Swiss/Austrian Alps sees much less traffic and has amazing terrain with very comfortable huts. This trip included several Crested Butte folks as well as my brother (another guide to share the load!) and my father, Murray. The Silvretta is a great into to ski touring Euro style. The altitude is relatively low, the huts are spacious and comfortable and there is less pressure about getting to the next hut and more focus on skiing up all the terrain and enjoying the surroundings. A quick stop over in Chamonix to get settled in at my "summer chalet", then it was off to meet my clients for the famed Haute Route traverse from Chamonix to Zermatt. Our first day started off a bit auspiciously with a descent of the Vallee Blanche in a total whiteout. We did get a quick clearing enough to look around at the Mont Blanc Massif and the Dent du Geant, before feeling our way down the glacier to the Requin hut for lunch. Luckily the next day dawned clear for our departure from the Grand Montets ski area into the wild Argentier Glacier. The next day proved to be rather challenging, first finding our way through the broken up glacier, then navigating two large glaciers in a complete whiteout to reach the Trient hut. While this day was difficult, the bad weather did lay down a foot of fresh snow which we were able to farm throughout the rest of the trip. In hindsight I would take one whiteout day for six days of sunny powder skiing anytime! We were exceptionally lucky to have such good conditions for the Haute Route agin this year. Other guide friends were swearing to only do the HR on my schedule in the future as I have been blessed two years in a row now. Arriving in Zermatt, I received word from my brother in Chamonix that a quick hit to Finale, Itlay for some spring limestone pulling on the Mediterranean Coast was in order and I better get it together. I caught a train at 6:15 the next morning back to Chamonix where I was granted one cup of coffee and an hour to switch from skiing to climbing mode and get my kit in the car. By 4:30pm that same day I was enjoying a sunny overhanging crag and my first test of Mammut's new Smart belay device. This thing proved an easy addition to the rack with easy feeds for the leader as well as easy holding power for the belayer. Four days later, with fingertips burning, we headed back to Chamonix feeling good about our early season sends and looking forward to more warm sunny rock. Is this photo of Geyikbari/ Josito, Turkey?